Leading Force Energy and Design Center uses a team approach to design and construction. Our multiple member companies share the goal to benefit homeowners by developing healthy, energy-efficient projects within a manageable budget. We believe this integrated team approach will be the future of home building and renovation. ARCHITECTURE SERVICES – New homes or remodel designs for existing homes. CONTRACTING SERVICES – New homes, remodels, energy retrofits. SOLAR POWER – Residential and commercial solar power systems. HEATING/COOLING – Energy-efficient systems to provide thermal comfort. SMART HOMES – Network infrastructure for all types of controls. ENERGY SERVICES – Energy audits, air sealing, ventilation, weatherization. TRAINING – Educational classes in sustainable building-related topics. CONSULTING – Integrated plan reviews with the entire team for a single fee. PRODUCTS SHOWROOM – Sustainable, green, durable, healthy materials. We offer the full suite of architecture and construction services - for new homes, remodeling or light commercial projects. We are specialists in designing and building for the unique climate in Central Washington. Our specialties include construction and systems that promote healthier indoor environments. Our many options for energy-efficient homes include solar panels for power generation; geothermal heating/cooling for comfort; thermal shell design; low voltage lighting and control systems; advanced air sealing techniques; and whole house energy audits. You can see these products and systems in our showroom. In addition to our team of experts in sustainable design and building, our public design showroom in Downtown Yakima features a wide array of finish materials, systems and services that have been vetted to provide beautiful, healthier indoor environments. Products include tile, carpet, wood, reclaimed materials, flooring, countertops, cabinetry, windows, doors, wall finishes, and plumbing fixtures - and more. Leading Force conducts training and seminars for the general public, contractors and subcontractors in energy efficiency strategies, energy codes, and other areas. Everyone lives in a healthy, energy-efficient, sustainable environment. 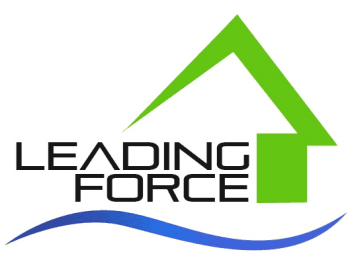 Leading Force provides the best in healthy and energy-efficient design, technology, education, products and construction services. IMAGE ABOVE: Renovation of Sunrise Dental of Yakima by Leading Force Contracting. 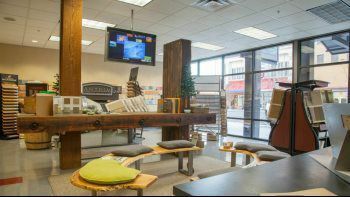 Products from our showroom include: reclaimed barn wood for the dark wood accents above the wall, at the reception desk and window frames; decorative wood backdrop behind reception desk; natural backlit stone composite at the reception desk; granite and metal countertops in the reception area; and artistic natural forms in the second story windows. "Leading Force is a host of information for energy conservation and family friendly design:) Well done guys!"